Social media has quickly taken over our world. It has become especially relevant in the sports universe, where instant access to information is becoming easier and easier to achieve. In fact, it appears as if all news breaks via Twitter rather than normal, more accustomed news outlets. So how do you capitalize on this? Other than the obvious idea of following Twitter closely to stay up to date on all the news, there are other things you can do as well. One of the things that has worked for my site – Lakers Nation – is the Twittercast for NBA basketball games. While I was working at Disney, I was put in charge with showing the marketing departments how to increase traffic to their respective sites with social media tools such as Twitter. At that time in 2008, people were just using twitter to share about where they were or what they just ate. I honestly didn’t care about that kind of stuff. Since I know most people used twitter through their mobile device, my goal was to convert everyone’s mobile device into the modern day AM Radio. 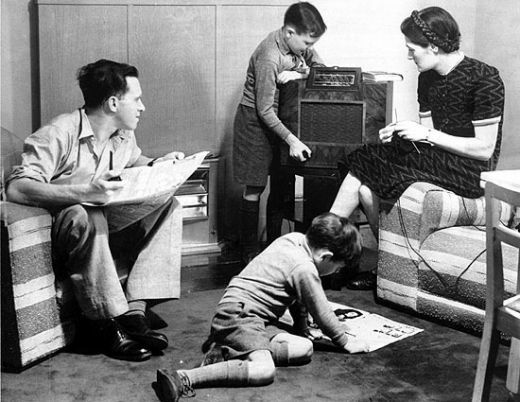 Remember the scenes from back in the 40’s or 50’s of families and friends huddled around their radios to hear the latest homerun of their favorite baseball game? Well, that’s what I wanted to do and with twitter, it worked. Prior to the game, I would hit up youtube to hear recordings of my favorite broadcaster of all time, Chick Hearn, to get me in the right frame of mind. then I would turned on the Lakers game and start typing away about each play with as much detail as 140 characters would allow me to. – Kobe snares the rebound, outlet pass to Lamar to a cutting Pau Gasol . . . Dunk You Very Much w/the And One. You couldn’t buy that kind of marketing. Another key to the game is consistency. Once you’ve established a reputation you cannot go back on it. Whether you like it or not, people begin to rely on your updates. If you’ve become a legitimate source for content (regardless of what type), people are going to begin to increase their expectations. Through Lakers Nation I have learned exactly what my audience is looking for in each tweet. I know what is popular with them and what isn’t. If need be, I could compose a tweet that would be re-tweeted by hundreds of fans. I could just as easily say something that I know would irritate my readers. Obviously the main focus of the Lakers Nation account is the Lakers. But it goes far beyond that. There is news that may not be directly relevant to the Lakers that the readers will still be interested in. This is where things can become difficult. You must know your audience, and you must know exactly what information they want to hear and what information they don’t. “It’s Easy When You’re Using the Lakers Brand to Get Followers!” You know what? You’re right, so I decided to start over. I’ve decided to re-dedicate myself to a site called Bunkers Paradise, which is a new golf community I started to crowdsource golf equipment reviews. What started out as a way to find used golf clubs online has blossomed into a growing online community focused on the game of golf. However, establishing a Twitter following can become difficult when you have nobody there to read and re-tweet your messages. Obviously, I can’t take the same approach with Bunkers that I could with Lakers Nation because of the different audiences. There are things that will work perfectly for a basketball fan that someone following a golf website just doesn’t care about. So it becomes my responsibility to find a new way to connect with a new set of fans. I must learn their tendencies and adapt to them. This is crucial, because if you force your fans to adapt to you then you will lose readers quickly. People in the modern age don’t want information that they deem irrelevant. In a world of focused and centralized news, sports and information, people only get the news they want to see. If you don’t give them what they want to hear they will move on and find someone that does. Keeping the attention of your audience through Twitter is difficult, but can be very beneficial to your website. Overall, Twitter can be one of the most powerful tools your website has to offer. Especially when it comes to sports, you can give your audience a different voice and a different perspective on the game. Twitter is an odd medium. The updates that you post are almost immediately buried with other posts and updates from the other accounts that the user follows. So unlike a bad article or even a Facebook post, a less than perfect tweet is quickly forgotten. But that doesn’t mean taking every tweet seriously is unnecessary. Every tweet counts, especially in sports. So while tweeting, act accordingly. By the way, this wouldn’t be a John Chow Post if I don’t self promote, so if you’re into Golf, come follow us @BParadise & if you’re a Lakers fan, come follow us @LakersNation. Thanks! Thanks to Daniel Buerge @danielbuerge_la – the editor in chief at both BunkersParadise.com & LakersNation.com for his contribution to this article and if you’re feeling really follow friendly, find me @MrGaryLee.